Seven different categories of sweet wine and more than 100 different sweet wine appellations are existing in France. Sauternes is probably the best known of all – at least in a market survey, with almost 50% it was the best known among the wine consumers surveyed. The Vin Doux Naturel produced in much larger quantities knew only about 20%, even less Sélection de Grains Nobles. Sauternes belongs to the category of Vin de triees successives, wines in which the freshly picked grapes are often selected several times by hand on a table de tri, a sorting table, before further processing. These category includes, for example, Sainte-Croix-du-Mont, Loupiac and Cadillac on the right bank of the Garonne or the Loire appellations Bonnezeaux, Coteaux de Layon and Quarts de Chaumes. The southern French Vin Doux Naturel (VDN) represent another category. VDN are wines, whose natural sweetness of grapes is obtained by an early termination of the fermentation with 96% alcohol. The VDN include, for example, Banyuls, Rivesaltes, Maury and Muscat from Frontignan, Lunel, Mireval and Saint-Jean-de-Minervois in Roussillon-Languedoc. VDN is also produced in Rasteau on the Rhône or in Cap Corse in Corsica. Originating from the Loire or Alsace, the Vin de Sélection de Grains Nobles (SGN) must be made from very mature and at least partly with noble rot infected grapes, making them a French equivalent to the German Beerenauslese. According to the German late harvest is the category of Vin de Vendanges Tardives (VT) a wine, whose grapes have to be harvested late, – at a date which will be determined by the authorities. 259 appellations in which Vendanges Tardives is produced, are located in Alsace, another two can be found in Gaillac and Jurançon. 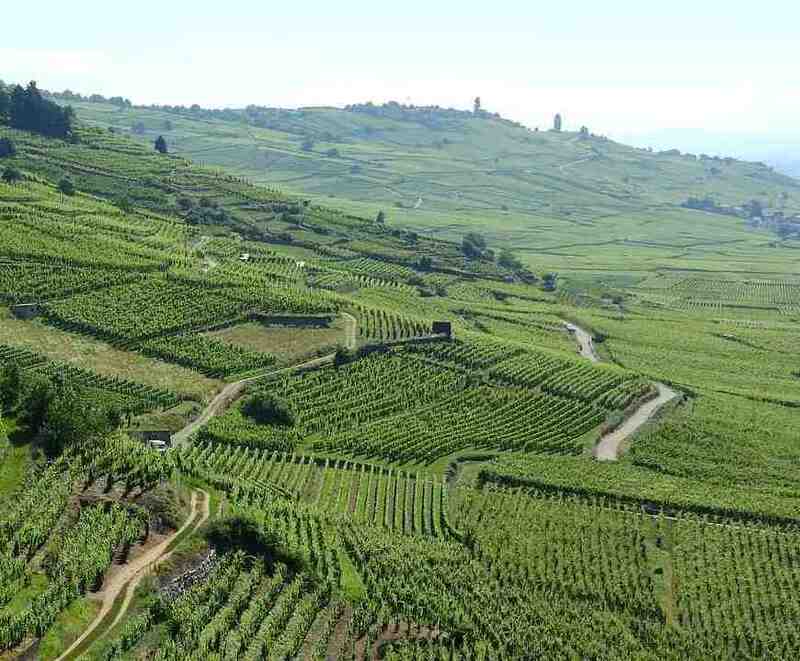 However, while the Vin de Vendanges Tardives are always more or less sweet in the last two appellations, there are also dry Spätlese wines in Alsace. The Vin de raisins surmûris is produced from overripe grapes, as the French name already suggests. There are approximately 30 different local IGPs (Indication Géographique Protégée). The residual sugar of this, the late vintage similar wines moves between semi-dry and sweet. Well matured grapes, dried on the vine (hors souche) or in boxes, in attics or the eponymous straw, are used for the Vin de Paille (straw wine) for must production. The most well-known French Vin de Paille comes from the Jura wine region, from the appellations Arbois, Côtes du Jura and L’Etoile. Other French straw wines are the Vin de Paille de Corrèze from the Occidental Department and the Hermitage Vin de Paille from the northern Rhône. Common to almost all French Vin de Paille, in addition to the drying of the grapes, also a about three-year maturation, often whole, or at least 18 months in small wood. Vin de Liqueur is made by adding distilled alcohol to pressed unfermented or slightly fermented grape juice or mashed grapes. This type of wine is also known as mistella. Well-known French vin de liqueur are the Pineau de Charentes, the Floc de Gascogne and the Macvin. The added acohol is Cognac in case of Pineau de Charentes, Armagnac for Floc de Gascogne and Marc du Jura for Macvin. There are also other, more or less sweet wines, from demi-sec (semi-dry) over moelleux (medium sweet) to doux (sweet), which are permitted in some appellations in addition to the dry specimens of the appellation. These include the wines from the Loire appellations Vouvray or Amboise.